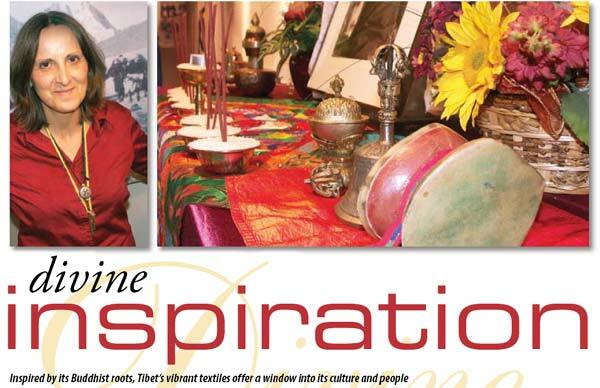 This month, long-time Buddhist Anne Hill fulfills a wish of her late family friend. Tibet and Beyond, an exhibit curated by the human ecology graduate student, is a glimpse into the fabric of Tibetan culture, and showcases traditional Tibetan textiles influenced by the culture's Buddhist roots. And her close friend, a Buddhist monk who gave lectures on Buddhism at the University of Alberta in the 1990s, would have loved the exhibit, she says. "Lama Kaldan always wanted the U of A to put on something for the Tibetan culture," says Hill. "He liked the fact that the university community acknowledged the Tibetan people and their culture. The cultural exhibit would have pleased him immensely." Hill's exhibit is up in the Human Ecology building foyer until Dec.6, and compliments her graduate research on the importance of costume and performance to Tibetan women in Calgary. "It's very important for them to perform traditional dances in traditional dress... to represent their culture on the Canadian stage," Hill says. She explained that since China's occupation of Tibet in 1959, thousands of Tibetans - like the dancers featured in Hill's thesis, and the late Lama Kaldan - have scattered across the globe. In 2005, they struggle to hold on to their culture. After completing her undergraduate degree in home economics in the 1980s, Hill became interested in Buddhist thought and got to know the Tibetan community in the province, since Buddhism is the dominant religion in Tibet. "I'm fascinated and spellbound by the culture and the people," she says. So when she went back to pursue graduate school in 2003, choosing her research area was easy. "It's like the topic picked me. I've known the Tibetan community for 22 years. I was introduced to a lama in the 1980s, and I've had a longstanding connection with the Buddhist community in Alberta." In creating the exhibit, Hill worked with Tibetans in Alberta, and many of the garments featured were supplied by people in Calgary. 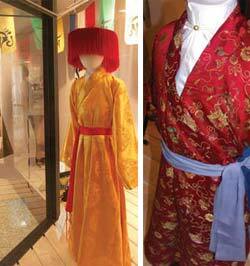 The exhibit features clothing worn by both men and women, including the horseman's garb, complete with felt chaps, a yellow silk chuba (robe) and red shongsha and the blue woman's chuba, which boasts a striped pangdhen (apron) worn only by married woman. Because Tibet is so heavily influenced by Buddhist thought, its textiles reflect this important element. For this reason, a Buddhist shrine designed by Lama Kushok of Edmonton's Tibetan Buddhist Centre forms the exhibit's centre piece. Auspicious colours like saffron and tourquoise hang above a shrine's mantle, upon which flowers and ritual objects sit. Among them, bowls of rice and incense, mala (prayer beads), damaru (ritual drum) and a bell with dorjee (thunderbolt symbol). Like the clothing textiles, the eight Buddhist symbols are delicately woven into the eye-catching tapestries adorning the shrine. While the garments juxtapose bright hues and different designs and fabrics, all of the elements work together in harmony, says Hill. "There's many elements to it, but there's a coherence," she says. "The Tibetans are able to bring many elements together, but with balance." "When you look at Tibetan costumes, you can't help but be hooked, because visually there's such a strong aspect to it that you cannot ignore it." Hill says the exhibit and her thesis work have shown her the richness and complexity of Tibetan culture. "It's true that the more you learn about something, the more you know you're just learning more. There's a lot more to do in the area, I could do a lot of work.